There’s plenty of music out there that can be simply labeled as ‘background noise.’ Something that can you can listen to and just be entertained. Many of us within the metal community are drawn towards it because it offers a greater opportunity. It gives you something more to latch onto and enjoy on many levels, and it can cover a variety of topics outside of the mainstream. 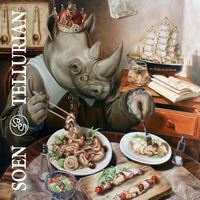 Swedish progressive metal band Soen have been taking this approach from their onset, but it’s been no clearer than on their upcoming fourth album, Lotus. A combination of entirely dreamy material with heavier and more boisterous sections, Lotus is a fascinating piece of music that feels entirely from the heart. Even going outside of the proggy material itself, there’s still much in the way of thought to be had, such as the intriguing cover art, or even the band’s recent video for the song “Martyrs.” All of which provided some fodder to discuss with drummer Martin Lopez, along with some drum talk, and what defines Soen as a band. 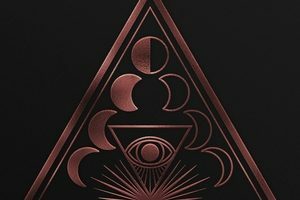 Dead Rhetoric: What does Lotus represent for Soen? Martin Lopez: I think it’s a little bit of the same – a natural evolution of us as musicians and trying to write better music, songs, and lyrics. It’s a matter of progressing in the right way. Sound-wise, it’s a lot better and we are all really happy. I don’t think that with the prior albums we were as happy. We always found issues with the production and other things. This time, we are really satisfied with what came out. Dead Rhetoric: What does new guitarist Cody Ford bring into Soen’s sound? Lopez: A lot of heart. I love his feeling; the notes that he picks were something that we, as a band, lacked. There was something missing on the guitars that wasn’t there. Even if it’s a bass/drums type of band, we wanted a David Gilmour kind of touch: a lot of feeling. I think he did an amazing job. On the softer songs, he’s great. It’s really cool for a younger kid like him. And he’s a great guy, which is important when you are going to spend a couple of months on a bus together. He fits perfectly. Dead Rhetoric: Could you discuss the contrasts between more dreamy sequences and heavier passages in the album? Do you like those contrasts within the band? Lopez: For me at least, I don’t feel a song is complete until it has a variety and it reflects my mood in writing it. It reflects the human essence. You can be aggressive, you can be quiet, or you can be sad. You need to have all of those emotions in a song to feel that it is complete. We work a lot on keeping the flow of the songs, but having as many ups and downs as possible and keeping us on an adventure. Dead Rhetoric: Do you feel that the band has gotten past all of the Tool comparisons at this point? Lopez: I kind of moved past that point – the first album sounded a lot like Tool because we wanted to sound like Tool. But then we just changed. We started doing different things and the music came out differently. It never really worried, or cared about that – being compared to Tool is fantastic [laughs]. They are one of my favorite bands. When we started Soen, the only band that Joel [Ekelof] and I had in common was Tool. We didn’t know if we would make another album at that point, but we wanted to make an album with that kind of music. We had a good time and decided to do another one, and since then I think the band has found its own identity. Dead Rhetoric: Could you discuss the cover art? I’m sure it can be interpreted in many ways. Was that an intentional choice to keep it open? Lopez: Yes, definitely. I think that both musically and visually, you need to make people think. You shouldn’t just serve them everything. You need to have something more than just fast entertainment so they can do something else while listening to the music. For me, when I listen to music I want to be challenged. I want to use my brain and my ears. We really tried to be a little bit more than entertainment and give something of value. The cover artwork is one of those things. We worked with an amazing artist and told her different ideas we had and what the album was about, and she put our words into symbols and the painting is amazing. Lopez: It’s just a video – somehow people got really provoked and that’s why we did it. We were talking about different topics and knew that the producer for the video had done a lot of work with drag queens, so it just came up. When we talked about the idea, we discussed the idea of if we could do it and if people would freak out. Just the thought of it being 2018 and in Western Europe and people still getting provoked about five guys dressing as women – it’s just so stupid that we felt we needed to do the video. There’s an issue here that needs to be talked about. At the same time, we got messages from people saying that they loved the band but they can’t listen to us anymore because of the video. People are really taking it seriously. It’s always men – they get in touch with us and some of them are hurt, and some of them just hate us, because we have five guys dressing as women as Soen. I think we proved our point. The video needed to be done. Honestly, if you are getting provoked by this, you need to get some real life problems. It’s just completely stupid. We’ve been told we had a liberal agenda or these conspiracy theories. We are just musicians. As artists, we address issues that we think need to be addressed. We don’t have any interest in any of that. But of course, we support the right for people to do what they want to do without hurting each other. It’s part of being free. If you don’t support that, then you shouldn’t listen to us because that’s really important to us. Dead Rhetoric: It’s crazy that in this day and age, something like that can be so provocative. Lopez: It’s really weird, because people I knew that live around the corner – people reacted in ways that I thought belonged to the cavemen. But it’s a good video, I think it has value. We are happy we did it. Dead Rhetoric: Being in several high profile bands before Soen, how does Soen challenge you as a drummer? Lopez: I think it challenges me musically: to play for the music and just to be a solid drummer. In my prior bands, the kind of music that we played allowed me to do a lot more stuff behind the drums. There’s a lot more thinking behind what I have to play. There’s not really room for anything that will distort the vibe of the music. 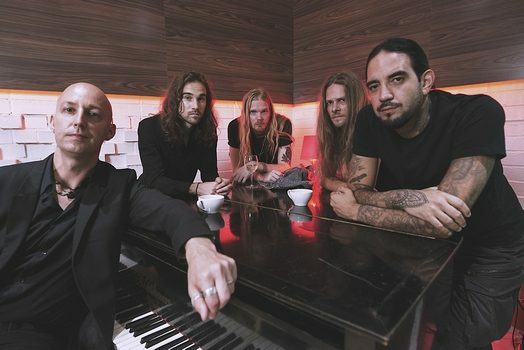 I think as a musician, and because I write most of the material, Soen has challenged me in many ways that my prior bands never did. Dead Rhetoric: Likewise, what have you learned from your collection of experiences in different bands? Lopez: I think the biggest lesson is to be really careful with what you wish for, in terms of how big you want your band to be. To be in control of your band and your life – meaning that you need to be willing to tour, or not to tour, and not just to record because someone else wants you because there’s machinery behind you that creates money. I think the most important thing is to love what you do every second. That is something that we are careful with. We don’t do a lot of shows each year, and we try to enjoy every minute because we don’t have any high hopes on Soen being a huge band. That’s just secondary. We really keep it protected from everything on the outside. Dead Rhetoric: So there’s no real outside influence. You are just making exactly what you want to make. Lopez: Definitely. That’s a part of every label that we sign to, every person that we work with. This is not someone’s salary. We aren’t out here to be rich. We love our music, we want to tour, because we want to share our music with our fans. But it needs to be done as we want to do it, otherwise there’s no point. I’ve been in the position where I hated music, which is what I love the most and it’s an awful place. I don’t want to go back there. 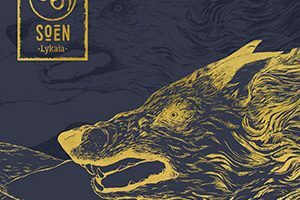 Dead Rhetoric: Four albums in at this point, what defines Soen from a musical standpoint? Lopez: I think there are certain qualities to our music. There’s a lot of emotion and there’s value in our albums. Myself, I really like what we do, and I think we are a band that if you are interested in music and want to have more than something to headbang to, maybe you should check us out. Dead Rhetoric: As you’ve progressed in music, where does that push come to continue mastering your instrument, the drums in your case? Lopez: I think it’s an obsession. It’s something I have to do. It’s what I do best and it’s the only thing that I really have an interest in. Writing better songs and being a better musician is the only important thing. It’s not about the drums anymore, it’s about writing better music. It’s about knowing that I am satisfying myself in choosing the notes and rhythms in a certain song. Dead Rhetoric: You were saying you have four kids at home. What are the challenges of having to do all of this while you are getting older and have a family? Lopez: There’s never enough time. That’s the problem. Otherwise, I think it’s a good thing. Life is hectic, and with four kids there’s a lot of running around. But once I get to be by myself and write songs it’s really therapeutic. It’s almost like meditating. It kind of keeps you at ease mentally, and keeps you from burning out. Somehow it works out really well. 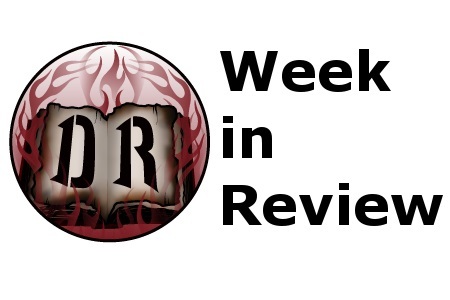 Dead Rhetoric: What plans does Soen have for 2019? Lopez: We have a few videos coming out, then we have a European tour in March and another in September. That’s pretty much it so far. We’ll see how we feel after the tour, and see what we want to do from there.